Don’t avoid worry. Understand it. In the time that you spend worrying, you are missing living! You cannot do both at the same time. You can either live. Or you can worry. If you are worrying, be sure, you may be alive, breathing, seeing and doing, but you are notliving! The nature of the human mind is that it will keep churning thoughts incessantly and most of them will be about your worries. If you want to stop worrying, then that want may now become a new worry! Instead understand why you worry in the first place. You worry about things, people, events, money, health, relationships, jobs, because you want them in your control or you want to know more about them or both. And when you are unable to do any of that, you worry. You say that you want a job. Is that a worry? Hardly. Will you get that job? Now, that’s a worry: because you want to control the outcome of your want and you want information about the future. My wife has gone to meet a friend. Is that a worry? Not really. But who is that friend? It is this greed for the detail, for that information, that will spawn a worry. And then the issue is no longer about the wife meeting the friend, it is about the gender of the friend and then it morphs into another, new, horrific worry: Is my wife cheating on me? How do you contain this human urge to want to control what’s going on and/or keep seeking information on what’s going on? The simple truth is, you can’t. So, wanting to stop worrying is an improbable vision to begin with. What you can do, however, is to attempt living. When you are filling out your job application, for instance, why do you worry about the outcome of the effort? Focus on the application you are preparing. Pour your heart into it. Don’t let your mind wander. Bring it to attend on the only, supremely important, singular task at that moment in your Life, the job application. You will never enjoy a sunrise if you keep thinking about your nightmares. Even if you are at the most beautiful resort in the Pacific, you will not even see the sun rise if you are not present in that moment. The cure to worrying is like the cure to diabetes. Once a diabetic, always a diabetic. At best, you can astutely manage your diabetes with your strict diet and exercise regimen. Even a day’s, or even a meal’s complacency or indulgence, can spike your sugar levels. So it is with worrying. 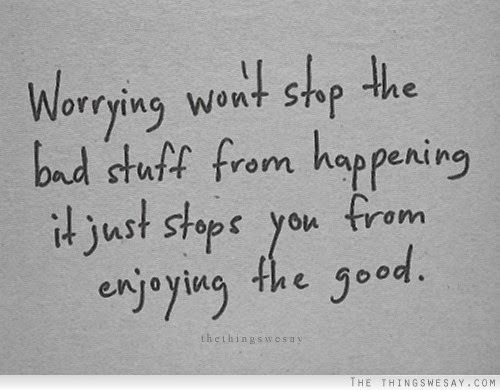 You cannot stop worrying. Period. But you can always start living. When you live, in the present, no worry can plague you! Will you please live, worry-free, today, a day that has been crafted exquisitely for you? Learn to trust Life and go follow your bliss! 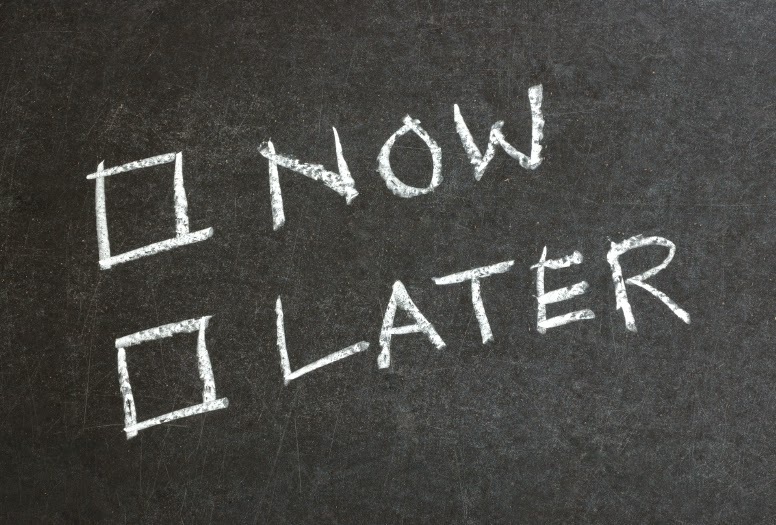 Don’t postpone living – go do what you love doing and Life will take care of your bills and responsibilities! My neighbor makes a very valid point. Most of us postpone living, hoping that we can “some day” live the Life that we want. The moot question is when is that “some day” going to arrive? The truth is that if you expect that day to arrive in the future it never will – because when you reach a milestone you have set for yourself, a new one will entice you. For instance, if at 20 you decide that you will make a million dollars, by the time you are 30, to secure your finances and then go to do what you love doing, chances are you will either make that million or you won’t. If you don’t, you will want to continue to keep trying and so you will push your “do-what-I-love-doing” deadline to 40. And if you do, you will want to make some more money, to feel more secure – because more the money, more the insecurity! Or finally when you are ready, your family responsibilities will weigh you down – either your parents need looking after or your spouse needs support or your kids need financial assistance. Or simply, after you turn 50, after over 30 years of running the rat race, earning a living, raising a family, meeting targets and working hard, you are just exhausted. You don’t want to take “any risks”. And this is how, sadly, Life gets postponed. There is no better day than today to start living the Life you want. You can either postpone living and keep suffering work and Life situations that you abhor or you can simply take the plunge and live the Life you want to – doing what you love doing. I talk from experience. Though I decided at age 29 that I will follow my bliss, it wasn’t until I turned 36 that I discovered what gave me joy. But over the last 11 years I have stood my ground – despite the gravity of my financial challenges – choosing to do only what I love doing and where I can create value. In this time, while money has been virtually non-existent, Life has taken care of all that I need. So, from the Life I have and what I have seen, I will always champion that when you know what gives you joy – just go do it. Don’t worry or feel insecure. Know that if you have been created, you will be taken care of and provided for. Learn to trust Life and go follow your bliss! Life is a limited period offer. The Buddha has famously said: “The trouble is you think you have time”. This is so true. Which is why we naively keep postponing living. It is important that we pause and reflect on our lives from time to time. And no better time to do it than today – this Monday, now! Ask yourself – What am I running around for? What do I really love doing? And what am I doing about it? Hopefully, your answers will awaken you to a Life of joy and you will go do what you want to do in the time that you still have left. When you let go, and live your Life without postponing it, Life will take care of you in ways in which you can’t even fathom! Author AVIS ViswanathanPosted on December 8, 2014 March 14, 2016 Categories Buddha, Carpe Diem, Don't Postpone Living, Fall Like A Rose Petal, Follow your Bliss, http://schemas.google.com/blogger/2008/kind#post, Inner Peace, Insecurity, Intelligent Living, Joy, Life, Living, WorryLeave a comment on Learn to trust Life and go follow your bliss!